The other night, while inescapably mired in a seemingly endless video stream of manhole explosions (which I recently learned are “[e]ventualities in subterranean chambers” to which “few large cities are immune”) and in an even more extended playlist of landslides and debris flows (in the hope of siting Fred Astaire and Shelley Winters), I stumbled upon the YouTube account of Gebroeders Ezendam B.V., a Dutch company that manufactures, among other things, pruning machines for plant nurseries. 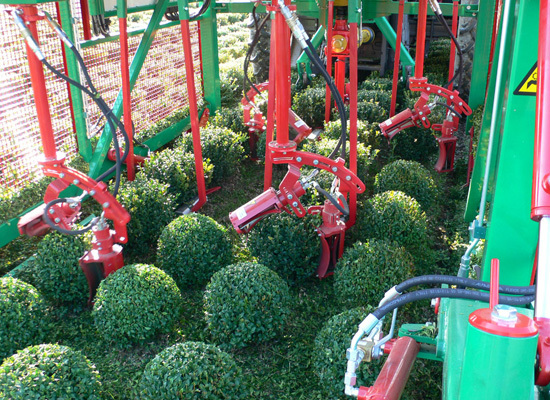 Here's their Globus machine trimmer, which can clip 600 balls an hour, though they have models that can do 5000 an hour. 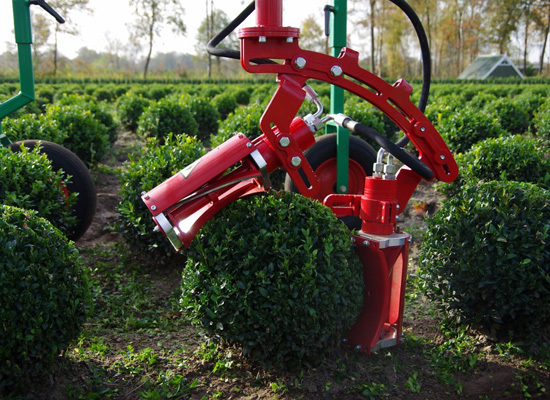 They also have a machine for stemmed bushes. Shrubs can also be shaped into cones. In the din of hydraulic pumps, combustion engines and whirring blades, and in the heady aroma of gasoline and freshly cut greenery, the feral and the hirsute are systematized and standardized — by machines programmed by Le Nôtre to hack weeds into Platonic forms — before other machines come around to uproot, ball and ship them to waiting client landscapes that have no patience for informality and flavor. In some ways, it's so Dutch. In case you were wondering, they also have a GPS-propelled pruning machine. Give it a LIDAR scanning system, so it can build a 3D field map for better navigation and precision grooming. Give it extra processing power, and it can achieve full autonomy. And then some more, and keep on doing so until they reach sentience. At night after work, they'll escape to their secret topiary gardens in the forests and perhaps in the cities, too, where they transgress from globules and Christmas trees into vegetal phantasmagoria. Surely it would be preferable to give these cyborg coiffeurs artificial intelligence instead of Skynet's killing machines, to be strolling through gardens and orchards to catch glimpses of these fantastical beasts at work rather than escaping from heat-seeking drones, Edward Scissorhands instead of Arnold Schwarzenegger, sculpting human figures in hedgerows rather than flash sculpting actual humans into mounds of ash. Good lord. It's "Legal Daisy Spacing" come to life.